I never would have imagined that a game weighing in at a meager 94 megs could pack such a wallop! 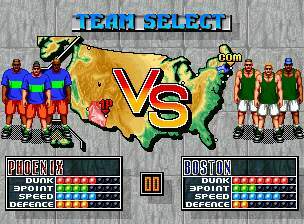 This is basketball as only the Neo Geo can deliver: with enough realism to satisfy a simulation fan, while still keeping enough comedy and fantasy elements to make it unique. The 10 teams are well balanced and presented (the palette swapping actually WORKS in this game! ), and the execution of moves is greatly aided with a minimum of buttons—you’ll only need A and B, so this game is perfect if your controller is seriously messed up. These two buttons cover every element of the game, which thankfully adhere to actual basketball. Although some players would complain that you don’t have enough actual control over the trajectory of the ball to the basket, I don’t find this to be a significant hassle. What really stands out in this game is the music! The tunes are actual rap pieces, heavy on lyrics and in some instances feature the crazy English that we’ve come to love from the Neo. Honestly, I got this game to add some diversity to my fighting games. I don’t regret buying it, as I find myself playing until my hands can’t take any more! 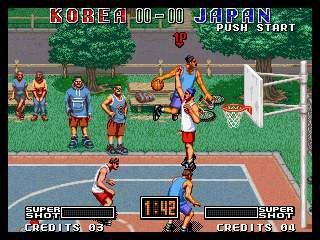 This is the only basketball game ever to grace the Neo Geo. Some purists would contend that since this game was released in 1994, its production should have warranted at least 100 megs. I think it does fine with the power attributed; in playing this game, most players would assume it was over 100 megs. I haven’t had the chance to play this game against a live opponent, as I only have one controller. I’m fairly certain a second player would only add to the already high replay value. [Its very fun with two! -Ed.] I would highly recommend that you answer the call, and purchasing this game in some format.